Hello and welcome to my website, PickMyPondPump.com, dedicated to providing the best pond pump reviews. Why did I decide to create a website about such a topic as pond pumps? The answer is simple, I was in your position couple years ago. I needed to buy a pump for our new garden pond and I had no idea how to decide which one is the best for my needs. I did a lot of research and was finally able to choose the right one. Now I want to help you in your decision by providing tips and reviews. What is a pond pump and why you need it? If you have a pond, no matter what type, a pond pump will be an invaluable asset to your water feature. The reason is the fact that without a pump, there will be no water movement. What that means is that it will be extremely easy for mosquitoes and other pests to infest it and start breeding in it. A pond full of mosquito larvae is probably not what you want. In case your pond is supposed to be inhabited by fish, or you are specifically making a Koi pond, you will need the pump to improve aeration of the water. Without it, the fish could possibly die. The pump will also take care of proper water filtration. Power Usage 250 Watts 199 Watts ? Apart from functional reasons, the sound of the circulating water will bring your pond to life. It will be a pleasure to sit near the pond and listen to the calming sound of the burbling water. Submersible pumps – These models are placed directly in the pond or a skimmer. An obvious advantage of such setup is that the pump is hidden from sight and doesn’t require any additional piping. Additionally, such pumps are less noisy. On the other hand, they are more likely to get clogged. External pumps – These models are placed outside of the pond, usually hidden in a bush. They are more powerful and more cost-effective. On the other hand, these devices will be more expensive are more audible than their submerged siblings. Additional pipes will have to be installed to bring the water to and from the pump. 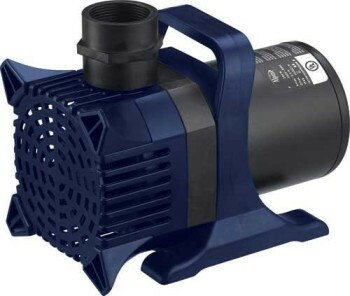 Most people usually go for the submersible pond pumps due to their easier setup and lower price. However, you will have to make sure to get a powerful enough model for your pond. Keep in mind that the submersible pumps are meant for smaller ponds. If you have a large pond or plan to create one, you should consider getting an external pump. It will cost you more to get it, however, it will make up for the initial costs in the form of saved money on electricity bills. What size of pond pump should you get? A general rule of thumb is to make sure that all of the pond’s water circulates once per 2 hours for ponds without fish. If you have or plan to have fish such as Koi in your pond, get a more powerful model. Below is a table chart by gardensupermart.com which should help you with the decision. If you are going to have a filtration system in place, you will have to account for that while choosing the right power of the pump. The reason is that the filter can “eat” almost 50% of the pump’s power! One thing to keep in mind is that the pump will be running 24/7 and that will cost some money. Depending on your budget, it’s advisable to choose a cost-effective pump, which will not ruin your wallet in the long term. Less energy-saving models are often cheaper than the energy saving ones, however the costs will eventually even out, and the cheaper model will become more expensive to run. Let’s say we have a pump which draws 300 Watts per hour; with that, we can estimate that the monthly operating costs would be $26.5 (average electricity price for February 2015 was 12.29 cents per kilowatt). You cannot make the electricity price lower, so make sure you get a more cost-effective pump instead. In this section, we will take a look at some of the best-rated pond pumps according to real customers. You will still have to consider what you need because even though these are the best-rated models, they are not the best choices for every pond. The powerful, yet energy saving pond pump is what most of us garden pond lover wish to have. The Cyclone pond pump by Alpine may be the best pond pump to get that meets the two requirements. This model comes in many variously powerful versions, with the 2100 GPH model being the least powerful one. We chose the least powerful one because it offers enough power for most typical ponds. If you need powerful one, you can choose from 3100, 4000, 5200, 6550, and 8000 GPH versions. With power also raises the price, so make sure you take that into account. 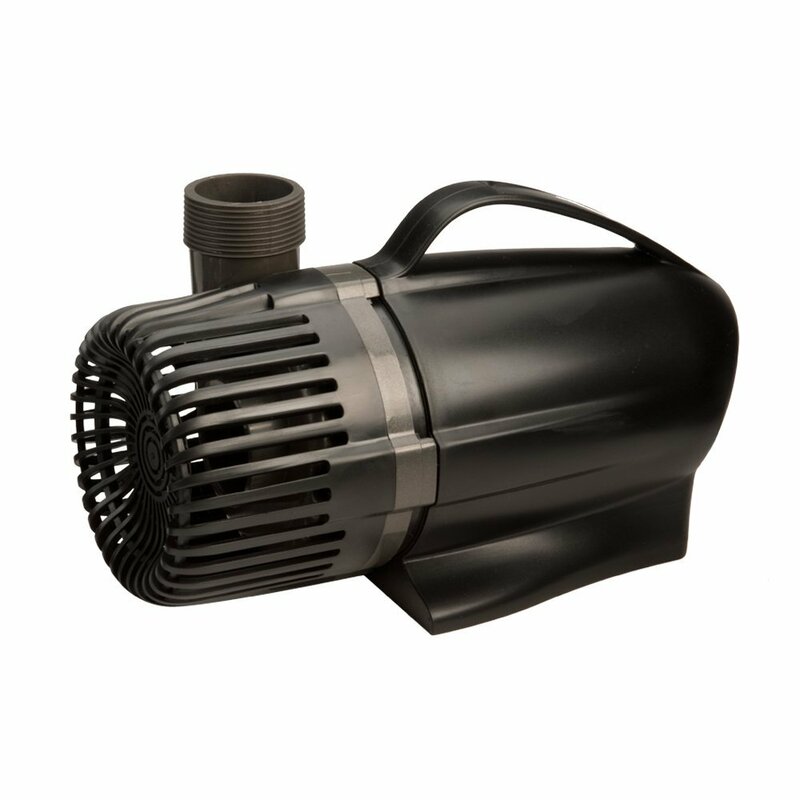 The Alpine Cyclone can be used as both an external or submersible pond pump. It can also be used in either vertical or horizontal position. The pump comes with 33 feet long power cord, which has to be properly grounded for operation. 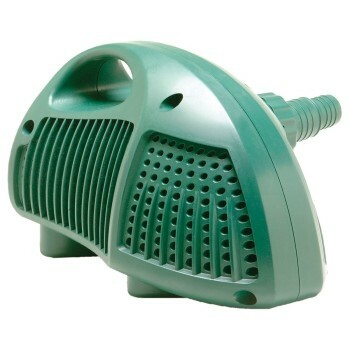 Its motor’s waterproofness is improved by the magnetic-driven technology, which allows the motor to be completely separated from the water cycle. The 2100 GPH pump will eat 190 watts per hour, making it very cost effective. Estimated power consumption is around $170 per year. Even though the pump is certainly made to last, it’s also backed by three-year long manufacturer warranty. The pump generally enjoys very positive reviews by customers. It rightly belongs to the top rated pond pumps available on the market. You can read our detailed review of the pump. Click here to buy the Alpine Cyclone Pump on Amazon! The Alpine pond pump wasn’t the best choice according to you? We’ve got another proposition for you to evaluate. This time, it’s a debris handling submersible pump which can, according to the manufacturer, serve ponds up to 3000 gallons with ease. The max size of the debris is ¼ inch in diameter, which is enough for most pond debris, and it saves your time spent on de-clogging the pump. With a power consumption of 199 watts, it’s similarly power efficient as the Alpine Cyclone pump given the higher power. The pump comes in two versions – 3690 GPH and 4235 GPH version. The motor is protected from water intrusion by epoxy encapsulation. Tetra Pond offers 3 year-long limited warranty for the pump. The Tetra Pond debris handling pump belongs to the best-rated pumps. You can read our detailed review of the pump. Click here to buy the TetraPond Debris-Handling Pump on Amazon! Even though designed primarily for waterfalls, the TotalPond 1200 GPH pump can be used also for fountains, water garden ponds or koi ponds. It is a submersible pump for medium sized ponds, which features a mesh barrier bag that prevents debris from clogging up the pump. It is suitable for ponds with fish such as koi ponds because it is oil free. If it’s supposed to be used as a waterfall pump, the max height of the waterfall should be 5 feet. The manufacturer claims the pump is energy efficient, however, we haven’t been able to find any information about its wattage mentioned in any product specifications. One of the customers mentioned that the pump eats 65 watts, which would make it a very good choice if energy saving was important for you. As with the other featured pumps, the TotalPond model is a popular choice for customers. It is one of the best pond pumps to buy for medium sized ponds. Click here to buy the TotalPond Waterfall Pump on Amazon! I can vouch for the TotalPond pond products. I have had couple of their pumps and they served really well! Glad to hear that, Mike.